The Yulin Dog Festival, an annual festival held in the Chinese province of Guangxi, has been the target of moral outrage for years. On June 21st, over 10,000 dogs will be killed, cooked and eaten for the festival, which is held on solstice. Much of the outrage stems from the fact that the festival is relatively new. It was established in 2009 (although the region does have a history of eating dogs) and has since become the epicenter of an entire dog meat trade industry. And that’s a problem, according to the festival’s opponents. The dog meat trade industry is more or less a black market, which means it’s not regulated by national or local governing bodies. Since China itself does not have dog farms, dogs must be imported, usually on long-distance, trans-pacific freighters. So, dogs often arrive sick, dying, and carrying disease, raising serious public health concerns. In addition to the general moral outrage and public health concerns, there are reports of cruel and inhumane treatment of the animals before and during slaughter (observers have reported dogs being boiled, beaten, strangled and burned alive), leading to mass protests from celebrities and animal rights groups alike. Indeed, a few mega-stars, like Ricky Gervais, have gone so far as to post graphic pictures on social media in an effort to incite change. The cumulative effect of such efforts has been noticeable. A petition to end the festival garnered over one million supporters (although more are still needed), and the Chinese government, under both social and political pressure, publically discouraged the practice of killing and eating dogs. There have also been reports of increased public pressure from Chinese citizens. Sources report that as the Chinese economy grows, more of the population starts to keep dogs as pets, and this portion of the population is understandably opposed to eating them, especially since dogs provide so many health benefits. 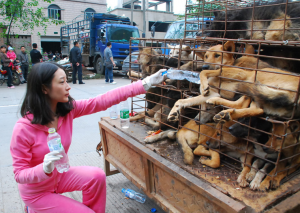 Under this pressure, some reports indicate the festival and dog meat trade are slowly fading. Still, others say this isn’t the case and that more social mobilization, protests, and governmental action are needed. If you’d like to get involved, you can sign the Change.org petition here.